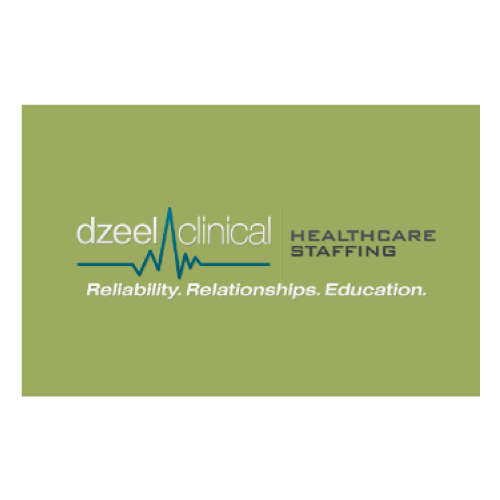 Dzeel Clinical Healthcare Staffing places Registered Nurses, Radiology Techs, Ultrasound Techs, RRT/CRT’s, Cath Lab Tech’s, Monitor Tech’s Rehab – PT, OT, SLP, PTA, COTA. They also provide Mental Health Workers (Sitters, Aides, and Advanced Practice Nurses) into nationwide travel contracts, local contracts, as well as, prn, temp to perm and direct hire positions. Dzeel is a medium sized company who matches each HealthCare Professional (HCP), regardless of their discipline or specialty, to a single recruiter who is responsible for that HCP. As they work together, the recruiter and HCP build a relationship based on mutual respect and familiarity which fosters a sense of friendship. Friends are never numbers… friends are family. Dzeel does have a clinical nurse liaison that is available 24/7/365, and they are JCAHO certified. To ensure that Dzeel HCP’s are happy with their recruiters, leadership listens! If either gives the sense of dislike or discontent, leadership moves the HCP to another recruiter. If either openly asks, they move them no questions asked. Dzeel offers all of their active HCP’s health, vision and dental insurance through the national Blue Cross/Blue Shield network of providers. Every Dzeel HCP is automatically enrolled as a participant in Dzeel’s Free Will Retirement Incentive program. For every hour a HCP works, Dzeel Clinical pays the HCP $.50 to apply towards the retirement option of the HCP’s choice and Dzeel takes care of the taxes!! Other benefits include: CASH Referral Bonuses whether you work for them or not, Overtime and Holiday Pay in excess of 1.5, Travel Pay and Travel Lodging Pay, Education Reimbursements, Free Nationally Accepted CEU’s to all HCP’s, PTO per assignment, Sign On and Completion Bonuses, Parking Reimbursement, Company Provided Coverage for Workman’s Comp and Liability and LIVE Personnel 24/7. Dzeel in the Navajo language can be translated to mean “heartfelt strength,” and that is exactly what you will find with them. They strive every day to serve their clients and staff with the ultimate in integrity and their demonstrated commitment to reliability. Dzeel Clinical was created to help meet the demands for high-quality healthcare professionals. Dzeel Clinical Healthcare (Clinical Staffing Inc.) is a woman owned HUB certified North Carolina based company. Dzeel Clinical is licensed by the State of North Carolina, Department of Health and Human Services, Division of Health Service Regulation to operate as a Nursing Pool Agency. As an established organization in North Carolina, their employee recruitment process is exceptional and their in-house procedures are proven. Dzeel is invested within their home state. In doing so they have become involved with the North Carolina Nurses Association, The North Carolina Psychiatric Association and they have been formally invited by the board and accepted as members of North Carolina Business Committee for Education which focuses on education and economic growth across North Carolina. Dzeel is also the only staffing company involved with Healthcare Works Partnership which is a regional organization addressing workforce needs in healthcare. Their passion is building strong relationships while becoming the most reliable and educated Team in the health care industry. Their management philosophy is focused on 3 key words: Reliability, Relationships and Education. They know that by focusing on these 3 words both internally and externally Dzeel is able to form the partnerships needed to provide the very best in patient care. Reliability for Dzeel Clinical is vital throughout their organization; from their internal team to their healthcare providers, being reliable is a critical piece of their partnership commitment. They employ professionals who are committed and dedicated in their specialty and also have a passion for patient care. Dzeel Clinical knows having a well-built relationship within an organization is essential to their success. What makes them unique among other supplemental staffing agencies is that they know each facility site is different and each manager will have their own procedures. Communication and making sure they follow the facility’s requirements is priority number one for Dzeel Clinical. They connect their clients with appropriate Dzeel internal staff at the start of all relationships to ensure that communication flows smoothly 24/7 and any questions that arise can be answered quickly. In regards to their HCP’s, Dzeel believes in open communication and encourages their HCP’s to address any concerns or questions that may arise during their assignment. Their organization’s emphasis on continuing education is one factor that clearly sets Dzeel Clinical Healthcare apart. They offer the practical and procedural courses to their healthcare providers in addition to giving attention to patient care within their training curriculum. Dzeel Clinical only submits skilled healthcare providers with an absolute minimum of one year of related experience to the assignment they are being presented for.